What a relief to take down the awful April Fools Joke! To view it, click here. I received complaints last year that some people missed it. I've got to have coffee and wake up before I write more, but I will! Day two of the river closed: I'm getting a little shaky, already. The hole that I fish when it is low and clear, is beautiful, and I'm just sure, full of fish. Yet, I can't fish it. Now, how is that for pure frustration? It works out quite well for the canines of the family. Last night, after dinner, we started our April walks. It's an annual tradition for us. There is enough light after dinner, and the river is low enough for retrieving sticks. I cringe, as I toss a stick into the very place that I would previously insist on absolute stillness and quiet, before a first cast. SPLASH! Oh! That's hard! I can imagine the fish darting from their doom, as Kilchis half leaps, half swims, after the stick. Water flies everywhere! Kilchis splashes into the water, first, and Dee Dee, refusing to race against his youth, waits at the shoreline to wrestle the stick from him. No, I don't get the rush of "fish on" during April on the Kilchis, but the joy from the dogs splashing and swimming in the river draws out giggles and smiles from me. Molly the cat jingles along with us, with her "bird protection" bell hanging from her collar. Yesterday we walked way upriver, and spotted a couple steelhead on their redds. What a beautiful sight! The deepest pools expose the fish, if you sneak up on them. I can stop and stare into the depths, for hours! 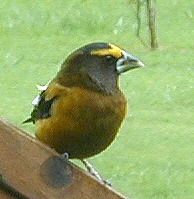 We had our first evening grosbeak yesterday. A pair, in fact. Well, actually, two females and a male. First, we spotted the female, and not long after, here came the male, all dressed in his bright, hilarious yellow feathers. Still no goldfinch, but I'm watching closely! We have several purple finch, and our resident squirrel, Buddy, showed up for a nut, or two. Our mountain quail is hysterical! Why is she here? She got caught in our fenced garden the other day, while Bill was out feeding. He tried to pretend he didn't see her, so she wouldn't spook, but she panicked, tried to run out like a road runner, but finally used her rarely used gift of flight to escape. She'll come right up close to the back deck. We have a pet mountain quail. Do you? No, I can't fish on the Kilchis river, but I think, in some ways, it's all a plan. It forces me to appreciate the things that I might miss, otherwise. New birds, throwing sticks for the dogs, and taking the time to appreciate the things that I pass by, while tossing a fly. There are so many new agates! Bright purple flowers, growing on the dark and lush green moss across the river! Wow! I hadn't seen those! They are gorgeous. I'll have to pontoon over, just to get a closer look! There is no way I can truthfully tell you that not fishing the Kilchis is easy for me, during the time it is closed. But, as I begin to notice the many miracles of life that pass me by while my focus is on the fly, well, I can't complain. Spring is full of life, new growth, new arrivals of birds! The world around me is a million different shades of green. Today, I think I'll stop and count them. Bill Hedlund said it best. "The way I can tell a great day on the river, is by the fact that I never look at my watch!" This, coming from an ex guide, is a really good indicator of a wonderful day, fishing! You know, tournaments really go against just about every reason I love to fish. I fish to have a great day, to get away, to relax... Tournaments bring out the competition in us all, and while I can't say I am totally immune to the fun of competition, I can say that fishing rarely brings that out in me. However, competition aside, tournaments bring people who love fishing together, and it brings them together doing something we all love! Spending time on the river, with our friends! 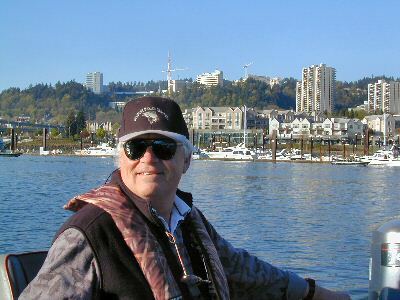 Bill Monroe, captain of our team, worked hard to get us into an ellusive spring chinook. Reports from around the area were that the springers were being finicky. One fish from a friend, caught a daylight, and a couple others, through out the morning. However, as I hung my bare toes over the side to dip them in the cool water, wearing a sleeveless top, in 75 degree sunshine in Bill's beautiful Willie boat, I could think of nothing I'd rather be doing! 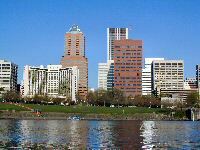 What a trip to be on the Willamette river, amongst tall downtown business buildings, fishing! Yes, the sky was really that blue, and yes, the wind was calm, and yes, yes, yes, I got sun kissed! I had fun. Can you tell? Everyone at the Kilchis river home can tell. I got up singing this morning, and haven't stopped. Every pet, and every resident has been greeted with a good morning songs. Bill groaned that it's too early for that. Never too early for happy, I say! Even our new little chicks received a good morning song! Bill and I drove to the banquet, after our long day on the river. We had risen at 3 in the morning, to catch Bill at Waverly, at 5. Shortly after the dinner celebration at the Holiday Inn, it hit both of us. We walked out to the truck, to pre organize some gear for the trip home. We both sat in the front seat for a minute, to collect our thoughts. We sunk hard, and looked at each other. I said, "We have a 2 hour trip home." There was silence for a moment, as we realized that if we were to head back into the celebration, we would end up visiting and talking, and laughing for hours. We hated to. We wanted to go back in! We hadn't even said our one zillion good byes! However, the best of our senses took hold, as we sadly closed the door, started the engine, and began the journey home. We missed out on the awards banquet, but it's a good thing that we left when we did. By the time we pulled into the driveway, our eyelids were heavy with sleep. The dogs greeted us wildly! The boys-- wow! They had made cookies, and cleaned the house, and we were totally impressed by their first evening, home alone! I tucked myself into bed, and I don't think it was five minutes, with my arms held tight around my beloved Kilchis, that I drifted off into sweet dreams of springer fishing. I am refreshed and new, and my-oh-my how I needed that day on the river! It is addicting, though, and I find myself making plans already, to do it again. Tomorrow? You know, tournaments really go against just about every reason I love to fish. I fish to have a great day, to get away, to relax. Tournaments bring out the competition in us all, and while I can't say I am totally immune to the fun of competition, I can say that fishing rarely brings that out in me. Bill Monroe, captain of our team, worked hard to get us into an elusive spring chinook. Reports from around the area were that the springers were being finicky. One fish from a friend, caught a daylight, and a couple others, through out the morning. However, as I hung my bare toes over the side to dip them in the cool water, wearing a sleeveless top, in 75 plus degree sunshine in Bill's beautiful Willie boat, I could think of nothing I'd rather be doing! I had fun. Can you tell? Everyone at the Kilchis river home can tell. I got up singing this morning, and haven't stopped. Every pet, and every resident has been greeted with a good morning songs. Bill groaned that it's too early for singing. Never too early for happy, I say! Shortly after the dinner celebration at the Holiday Inn, it hit both of us. We walked out to the truck, to pre organize some gear for the trip home. We both sat in the front seat for a minute, to collect our thoughts. We sunk hard into the car seats, and looked at each other. "We could just go...." Bill questioned. I am refreshed and new, and my-oh-my how I needed that day on the river! It is addicting, though, and I find myself making plans already, to do it again. Tomorrow? When? I really am a "spring ahead" type person. Contrary, however, to my favorite seasons. I think that "spring ahead" should be in the Fall. Then everything would be good! I just fall right into this schedule change. Everything feels right. It's 6 'o clock when it feels like 6. After dinner, I have time to take a walk on the river in the evening light. Last night, David joined me on the water. We took the little aquarium net. Annually, as the water recedes, we find pockets of water, dammed up. These pockets catch fry and they die there, unless we rescue them. If we are too late, tiny skeletons of fish to be, are left, dry and scaled, on the edges of the pool. I don't dare think about how many of these pools exist on the Kilchis River. I pretend it's only our home, that needs tending. There we were, laying on our stomachs on a small patch of grass, gazing into a small pool less than two feet wide, and approximately a foot deep. My hair dipped into the water, as we stared. David has wonderfully keen eyesight. Whenever I drop something that I can't find, I call "eagle eyes," and have David help find it. I had tried to rescue these fish the day before, but now with David, I knew our chances were better! With "eagle avian eyes" at the net, we both giggled into our reflections in the water. Laying on your stomach, giggles turn into guffaws, and induce more laughter. "Got one!" he exclaimed, with a scoop of the net. We both rushed to get up, dizzy from the change of altitude, and hurried the fry to the main stem of the Kilchis. "That's going to be a 50 pound salmon!" I breathlessly laughed to David, as we hurried back to rescue another. Back to our bellies, we studied the bottom of the pool, again. While searching for fry, we discovered tiny bugs working, maybe even baby crawdads, and even a baby mudcat! David scooped the net, and saved the mudcat. "That's going to be a bait robber!" I giggled, as he set the fish free. It was amazing how we had thought we had them all, and then we'd find another fry, and another! -- hiding under the cover of small vines. Their ability to camouflage is amazing! As we stared into the shallow depth of the pool, I imagined them reacting to our shadows, as if we were avian predators. They'd dart around, as I tried to direct them back to David's net with my finger, barely dipping into the surface of the pool. Big birds, we were! After a dozen or more rescued fry, I left David's side to assist my dog, Kilchis, in digging a hole. I giggled as he'd nip at me, for invading his work. "Move over, Kilch! Mom wants to dig!" For some reason, Kilchis will not let Mom dig. This is dog's work, I suppose, and women should not get their hands dirty. Right? 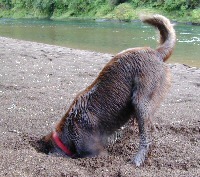 Molly the cat's bell rang, as she shot from half completed hole to hole, frolicking in the sand. Finally, David had had enough, and headed up to the house. I stayed, mesmerized by the beauty and stillness of the river in spring, and the total content of family life, here in the country. The river renews me. It rebuilds me. It covers all wounds, and heals all stress. As the light faded, tiny purple flowers across the river danced in the breeze, almost neon against the dark green moss. Just as I turned to go, the glassy stillness of the water erupted like a shattered mirror! The otters came out to play! What a show! I ended up watching their child like games, sitting on the still warm sand, from dusk until dark. Across the river, there are two large boulders, with a slide in between. It is slick and worn, from otters sliding down into the water. They do this each year. As I attempt to count them, I'm left to wonder who is new in this family of otters. They are so cute! On my list, today, is doing a net search to learn more about them. I was surprised to find out that they do not eat as many fresh fish as Bill cautioned had cautioned me. Now, he likes them better, too! Half wanting to go get David, again, but mostly glued to my seat, I watched their folly. Kilchis, now growing tired, sat by my side, watching also. Molly, lay behind me on a log. As I rose from my front row seat, I almost broke into applause. The outdoor amphitheater, that was the Kilchis river, was alive. I imagined what a grand stage this would be, and imagined Issac Stern coming to perform there, (as I had once seen him at the Hollywood Bowl) and then I decided I didn't need him. Instead, I slowly turned, and walked through the damp grasses in total silence, pulled towards the warm glow of the light coming from my home. The music was playing without the musician, and I was stunned by the performance. Oh, my! It's another three days from home for me, and the boys! I'm going to miss Kilchis! It seems just as I snuggle in to home life, and everything smoothes out and gets comfy, I am off again! Today, I have that apprehension that goes with going to the cardiologist with Andrew. It's our six month aortic check and echocardiogram. It always worries me, and I'm sure, somehow it worries Andrew, but he doesn't show it at all. Maybe I don't show it either. (except here!) It will all be fine, right? It always is. There will be no growth on the charts for us! Then, my sister's daughter is getting married. They secured the tiny chapel in Canby for the wedding, and I will be staying over night in Canby. They have asked me to play the piano. It's going to be a good one. They want classical music. Classical it is! I can't wait! After that, I get up Saturday and visit with family, or go to the mall, or whatever.. Kind of a lazy day away from home, until... Andrew goes to his first rock concert in Salem! Now, THAT is scary! I bounced back and fourth between going with him to that loud, (non classical) music performance, or staying at the motel, fretting. I'm going to fret!!! David, his younger brother will join him. David will keep Andrew in line, right? Lessee, where is Andrew's medic alert bracelet? Then, it's church on Easter, and brunch with my family. My Dad is home from Palm Springs for the weekend, because of Alison's wedding. Alison's future husband has been in Iraq for a long time. Over a year, serving our country. He will be marrying Alison, dressed in his military uniform. Gave me shivers when I heard that. I want to play military songs! The Star Spangled Banner! The Battle Hymn of the Republic! I can't do that, though, can I? How bout, "America The Beautiful?" No? Alright, I'll stick to the basics, but somehow, with him dressed like that, I think I could make people cry if I played military songs. Maybe I don't need to worry about people crying. This is our first baby of this generation to get married. I'm sure the tears will flow freely! You know, I was supposed to go fishing yesterday, and I was so looking forward to it. I was up most of the night, prior, not feeling well. You know, sometimes I get really tired of fighting, just to be well enough to do things. Thing is, I fight so hard, that I never give in to it and get really sick, so that I am incapable of doing things. Often, I go fishing, while I am sick. Sometime, I am going to let it happen that I get really sick, and get to lay in bed for a week. For some reason, that's sounding really good to me! A week in bed with the remote! Yes! Sometimes, people say to me, "You sure are sick a lot." Well, yes, I am. But I don't need to be reminded, do I? I don't think people understand all of what marfans does to people. Enough of that, sick or not, I'm off to the doc, then to the wedding, then to Andrew's... uh... concert! He's so excited! He absolutely adores Twiggy, some bass player, and he was up late night last night, practicing the bass! Believe me, I know it, because it vibrates through his room, up to mine, which is directly, overhead! I'll be back, late Sunday. I'm taking the laptop, so that I can help people with ifish. I'll hook up in the motels in the morning, and at night, just to check in. I spent a lot of time yesterday, playing travel agent for my summer plans. The OWAA conference in Spokane, the ICAST show in Vegas. Wait a minute-- I'm booking myself so thin that I need to put a sick week in there, someplace. But where? Have a great weekend! I hope you catch many springers, out there! I'll be looking forward to fishing on Monday, and on Thursday of next week. It's in my plans! I guess I'll have to put off my week, sick in bed, for another time! I mean, what would you rather do? Be sick, or fish? I know what I'd rather do! I was gone for three days, barely kept up with my e mail, while I was gone, and what did I want to do this morning? Fish! I told Bill, I'm so ready to load up the sled, and head for the Columbia or the Willamette, and frankly, we almost did! However, the Columbia tides are pretty backwards this week, and the fact is, I need to take care of ifish. I actually missed ifish, and like home, it's good to be here! I am very sad to tell you that Jack, our big cat, has been missing now, for four days. When I got home last night, I called for him in every direction. Sometimes Jack goes on hunting trips, or camping trips, or whatever it is that cats do. I'm still hoping he is doing that. It seems he always escapes when the weather is nice. Hopefully when it rains, he'll come home. It's really a problem here, to get the cats in at night. Especially Jack. He does not come when called, and his territory here is very large. We had a wonderful trip. Allison's wedding was beautiful. Upon arrival, I immediately checked out the condition of the piano. It's funny. I have played on so many pianos that I know to expect the worst. I've played pianos with certain keys missing, Kool-aid between the keys, pedals that don't operate correctly, or pianos out of tune so badly that you want to rent an electric! There is usually a work around. Well, someone had used Pledge, or some other dusting wax, on this piano's keys! Talk about slippery! I tried everything, from washing them down with a paper towel, to slowing down my tempos. Still, the music came out beautifully, although slower. I kept a wet paper towel in my lap, to dab my fingers on, in between songs. That created enough friction for each run. My boys kept me in stitches. Our first motel was only a place to sleep. No frills, no thrills. Just a bed in a clean room. Brunch, in the morning, consisted of coffee, and dixie bathroom cups for juice! David said the new slogan for their motel should be, "We couldn't afford a nicer motel, and neither could you!" The second motel, Shilo Inns in Salem, was pretty nice! We had a blast, there, waiting for Andrew's concert. David found a "Wunderland," which is a video gaming business, and Andrew and I lounged around, as I helped him count the minutes till it was time to go. It was his first concert! We had stopped at the Woodburn outlet mall, and had fun picking out clothes for Andrew to wear. My boys never want new clothes, so I had a lot of fun, dressing them up! Well, at least Andrew. David picked out two tee shirts. He had the run of the place, and he picked out two tee shirts. Wow, Dave. Stylin'! Finally, it was time for the concert, and I reluctantly dropped them off. I spent three hours, waiting and worrying for them, as the concert played out. I dropped them off 2 hours before the doors opened, and they were able to get up front. So many kids dressed in black! It was easy to pick David out, in his tan slacks and blue shirt. David's not into this black thing! If it is Andrew's desire to be different, by dressing all in black, I think he failed! Finally, the time came to pick them up. As I waited, and watched outside the door for them, the concert was still in progress. My heart sank as several teens showed obvious drug abuse. Some girls were carried out, by their boyfriends. Others stood, with trembling hands. I spoke with the security guard who told me that most of these kids, indeed, were on drugs. This was going to be a real eye opener for my kids. If I did not have enormous trust in my kids, they would not be here. Even so, I am reluctant to take them to another. I was divided between thinking that this is life, and they need to know this occurs, and the strong desire to grab them and flee! David's comment, after the show was "Mom, one thing I was not prepared for, was the free use of drugs. Someone asked me for papers to roll a joint!" I bought the kids TV dinners, for when they got home. They ate, and we were fast asleep, a little after midnight. On Easter Morning, I rose before my little sleepy rock and rollers, and made coffee. As I sipped the first cup, I threw back the curtains. Sunshine streamed over them and I sang out, in my loudest alto, "Jesus Christ Has Risen Today.. Halll al le luuuuuuuu jah!!!" They were less than pleased with my joyful noise. The Easter bunny didn't come to our room at the Shilo, and I was a bit surprised. However, while buying sparkling cider for our Easter brunch at my sister's, I was shocked and surprised to open the car door, and find Easter Baskets on their seats! Wow! While I was in Weizer's in Lake Oswego, the Easter Bunny found my boys! Pink baskets full of candy for sleepy head rock and roll teenagers? Yes! Easter brunch was delightful. My sister's home in Lake Oswego is gorgeous. It was lovely seeing my Dad, again. Laughter and even a few joyful tears were shed. My family is a blessing to me, and how we have all grown! My baby nieces all grown up, and one is now married? The long trip home was uneventful. As I drove down the driveway, Kilchis came flying out the back door, excited and waggly tailed. "Mom's home! Mom's home!" Yes, Mom is home. I'm catching up. I'm glad to be here on the river. The morning is fresh and new. The clouds are thick this morning, and I can smell rain in the air. Now, if only Jack would come home. I have yet to mention my doctor's appointment. I am a concerned over my test results. I have to digest the news before I can talk about it. My doctor said that now would be a good time to not play big fish. I have decided that he means whales and 10 foot sturgeon. Don't you suppose that's what he means? April 12th, 2004-- UPDATE! JACK CAME HOME! Just as the first drops of rain began to fall! With Jack back, and purring in my lap, I note that he is watching what I am watching. The spring flurry of birds, outside the window. Molly the smaller cat is still young enough to imagine she can catch them all. Jack is wise, and knows it's better just to gaze, and to dream. Jack really is wise. The only reason that I can come up with, to explain why he hasn't been eaten thus far, is his wily and wild nature. He's keen, jumpy, and distrustful. If it had been Molly that was missing for days, well, she's such a ditz, that I'm sure she'd get eaten. I can imagine her easily going up to a raccoon, or a coyote, just to say hello. She's a doll, yes, but she needs to be protected. Yesterday, while gazing out into the open meadow, I saw her streak across the meadow after a butterfly, quite looking like a tasty treat to any wild creature, I'm certain. Back to the birds... 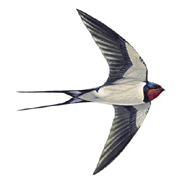 I just adore our blue and white swallows. We just nailed up another house for them, on the front beam of our porch. They instantly took interest, and have been circling it, madly. I have put out a ball of cotton that I purchased at the Backyard Bird Store. They flutter and circle from this, to the two houses set out for their use. They are such a beautiful blue color! Fascinating to watch. Bandtail Pigeons have taken up residence for the year, and as I walk out to the river, they spook from their roosts in the high branches of our trees. Their heavy wings flap, clumsily, as they "sneak" away. They are always on watch, waiting for the next batch of corn to be scattered on the ground. I have learned not to put corn in our delicate bird baskets or the back porch feeders. They are wild and rambunctious feeders, and destroy everything in their path. Although it's a delightful riot to watch, I can't afford new feeders! We have five grosbeak, three males and two females, so far, in count. What gorgeous birds! Two of them are on my flat feeder, as I (try to) write. This is very distracting! We have quite a few white crowned sparrows, and only a few goldens. Several purple finches! While I was gone, Bill called to tell me that 5 goldfinch showed up. Now, that is my job to discover the first goldfinch! I have been gone so much, that he even discovered the first hummingbird this year! No fair! I have put in a request, that if next year he spots them first, he is to say nothing. So, yesterday, I was requested to enter the kitchen for breakfast to watch the goldfinch. Sure enough, there they were! I'm still maintaining that I saw them first. It's just the way it should be! Oddly enough, we have lost our batch of 12 or more hummingbirds, and are down to one or two, who very seldom show up! Speaking of which, the seven feeders that I got all excited about and put out, all look to need fresh juice. I'll put that on my list. Maybe I'll take down a couple. I think I got a little over excited by the first migrating birds. I sure hope more find us, this year. They are very near to my favorites. Well, this has been your spring bird update, brought to you by iusedtofish.net. I really did! I used to fish! I have never in my life fished so little. The Kilchis river is closed, and somehow, springer trips to Portland, or the Columbia have been very, very scarce. If it's not doctors appointments, it is weddings, or Easter, or concerts, or something! I can only wait until Memaloose gets rocking... This is my hope, my future, my happiness! Tomorrow I find out if I'm having eye surgery soon. I'm pretty sure I will, and I have to figure out when in my fishing calendar would be a good time. I am risking losing this eye, and I had to stop and think about my age, and how many years I would have to use, or lose this eye. I think it's worth the risk. I really would like to see these birds better! I would really like to see fish in the water, like other people do! I want to be shocked and awed by the purple flash of a up river bright! I can't help but hope the results are wonderful! Sometimes I sit at the kitchen table, my little Nikon binocs focused to see things up close, and I dream that these are my real eyes. It marvels me! I'll never forget when I got my other eye fixed, and I spent hours staring at carpet fibers, and wood grains, and things I had never seen before. Even boxes of powdered sugar showed detail that amazed me. It's a real rush, I'll tell you! I want to do that again! Andrew is home sick. I think he is beginning to realize the marfan syndrome thing. If you are going to overdo it, as he did at the concert, you will probably get sick. You have to decide if it is worth it. I'm sure, for him, this concert was! He was four feet from a bass player that he nearly worships! Yip! That's worth feeling lousy for a while! I have to run to Astoria to pick up David's sax from the sax doctor. I better stop writing and start running. Have a great spring day! It sure smells nice out there, after the little dab of rain we got. OK, Jennie, stop writing and go forth with your day! I just LOVED that picture! What a cute kid, and I hear that he is quite a sportsman! Many experienced fishermen are inviting Zan into their boat! Not only is he good luck, but he gets up early with no complaints, fishes all day with no complaints, and helps clean up the area that he fished, afterwards! OK, I see a new club forming!The "I want to be like Zan!" fan club! I just love the ifish sticker on that fish! I do want to be like Zan! I do! I wonder if I'll catch a springer with an ifish sticker? Last night I was so tired, that I passed out by 7ish. I woke up for my favorite show, "The Guardian." I read on the net somewhere that they are having troubles with ratings. Well, it's no wonder! Again, the TV said to me, "This program will return next week," as they went on to some other show. It's called continuity, folks. Not only do they have trouble with continuity of weekly shows, but even the programs themselves, lately, have continuity problems! Sometimes I tune in, (when it is on!) and it's like they have made a program out of whoever showed up for rehearsal that week. Oh well, I still love the show! I fell asleep after the disappointing announcement, and woke up at three, realizing that I had left my contact in! On the day that I need to drive to Portland to the eye doctor! Uh oh! So, I am typing blind, trying to rest my eye, so that I can put in my contact later, to drive. Sometimes I think that the marfan poster child should be Humpty Dumpty. Let's see... Who can put all of the broken pieces of my eyes and heart back together? When I spoke to the doc about surgery, I thought of that. When my eye doctor said that my eye had fallen apart in his hands, during surgery, I thought of that. My hope is that I will be able to spend the night in Portland, and then Bill will pick me up tomorrow morning to fish the Willamette. Maybe even get in some Nordstrom time, tonight! Now you tell me, what could be better than time at Nordstrom's and then fishing? What more could a girl want? I know! A whole lot of encouragement from the doctor's that they think they can fix my eye! I'll let you know what they say. For now, it's time to hurry up and work on ifish, and get ready again, to leave my comfy home. I hurried up and worked on ifish, and got many accusatory letters from an ifisher, upset about a thread that had been posted. Now, I'm stressed, blind, and in tears... Just another lovely day on ifish. Oh well, at least the tears can flow freely without contacts in! Sometimes I wonder why I do ifish at all. But, then, someone posts something like this, (Click here!) and it's all better again! ...and what a lovely day, it was! I spent the day yesterday, catching up and doing things I like to do! Ifishing, gardening, and taking a long photography walk by the river. Wait. I can't stop laughing! I just woke Andrew up. I heard him slide back the shower door, and screech a bit. Then, "Mom, what should I do with this rat?" I wasn't sure what he said, so he repeated it, this time a bit louder. I said, "Why, throw it away! Is it a rat, or a mouse? How big is it?" There he was, holding the offending headless creature with a wad of toilet paper. "I don't know what it is. It's bigger than I usually get!" Andrew has a gift of delivery that just cracks me up. Bigger than he usually gets? It was indeed, a rat! A big one! Now, you tell me. Why do the cats leave their catches in the bath tub, or the shower? I get a kick out of those cats and their catches! I don't know how many times I've had to sanitize my bathtub, before use! Yuck! Now, onto my favorite places. It all starts, on my deck! My place, underneath the cherry tree. Finally, to rest in my favorite place! Larger pictures of this, here! Anyway, it was a lovely day. 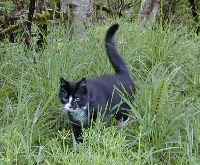 My kitty, Molly had a great time, chasing Kilchis and I around. Before I left, I was up showering, when I heard a loud bang, and Kilchis ran downstairs in a hurry. I wasn't sure what was going on, and dismissed it for imaginary creatures of the morning. Later, however, at my computer, I heard a bang, again! Kilchis jumped up, and I followed him to the kitchen. WOW! There must have been 200 Bandtail pigeons on my deck! Two feeders, lay on the deck, broken! As we approached, they all flew at the same time! A gray cloud of birds lifted from their feast! I had to see this again, so I put out more corn, and returned to my computer. I waited 15 minutes. Quietly, as these birds are very spooky, I grabbed and loaded my camera, held Kilchis by the collar, and slowly, ever so quietly, made my way to the kitchen again. There they were! OK... camera in position, I creep to the window, to get a good picture. It was awkward, holding Kilchis so that he wouldn't start, while holding the camera in position. I could see them! They were covering the deck, again! I couldn't make out the bright blue color of the picnic table! They were in every basket, every feeder, covering every inch of wood! I was almost there! Step, by step... and the phone rang! Argh! They flew! No shot from the camera, nor did they return, yesterday! I'll have to try it again, today. 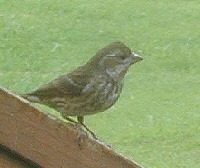 However, while sitting at the kitchen table, I did see a whole flock of grosbeak fly by. We had counted up to six, but after seeing them whiz by, yesterday, I'd have to say we have at least a dozen. The swallows are busy, this morning, building nests. I saw one returning male hummingbird, yesterday. I hope this is the start of a new batch of them. I've pretty much given up on Springer fishing, this year, at least, until Tillamook Bay opens. I just can't seem to coordinate what I have to do in Portland, with fishing. 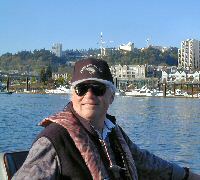 Bill is out, today, on the Willamette. I hope to heaven that he gets one. Seeing picture after picture of springers, and hearing all my friends talk about smoked springer and barbecued springer, well, it is enough to drive my taste buds wild. Just one bite, please! When I think of springer, I think of the way Chris Sessions cooked it for us, once. Man, was that good! With chipoltle sauce, on the bbq! If you want to get one, go with Chris! I don't know if he is booked.. probably, but you can always call to ask! He is bonking them! The springer rush of traffic on ifish has tapered off a bit, and I am able to do things at a slower pace. I'm enjoying it! This morning, I hope to try my luck at jetty fishing. I need a fishing fix of some kind, and I can't wait! Gotta shower, and go do that! Today, I wrote chapter one in the Life and times of eye surgeries. It is located, here. I'm so written out, after that, that all I can say, is... Wow! What a life I've lived! The kids are home, with a friend over for the night. They are sound asleep. The morning is fresh and clean, and the birds are just now showing up. I'm off for a walk on the river, with Kilchis. Have a great day! There is a high wind warning out, today. I think it is Southeast winds that do not affect us, here in the Kilchis Canyon. Today's winds are predicted to be pure south winds. Strong southerly blowing gales that have been known to pick up trampolines and drift boats from our yard and toss them into the river, seemingly effortlessly. End over end and splash! I'll never forget the times David and I have run outside to check for the trampoline and over the noise of the screaming winds, yelled to one another, "It's gone!" This time, it is anchored with a sea anchor. Try us, now! Yesterday afternoon, I was absolutely exhausted, laying in bed. I heard the rain fall. I got up, and glanced out of the upstairs bedroom deck. Yes, it was raining hard, but the sound was different. Their was an eerie glowing light. It was muggy, and windless. It seemed all the world to me, like a summer rain. In the winter, the rain falls hard on barren muddy ground, and lands with a splat! It batters bare tree branches, and exposed rocks. 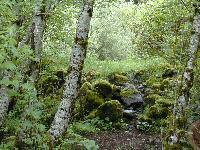 It is Springtime, and the Kilchis river valley is now protected by an umbrella of lush green foliage. The heavy branches of trees protect much of the rocky river bank from the falling arsenal of raindrops, and muffles the sound. Instead of hitting hard and bouncing, the leaves seem to absorb the rain, like a sponge. 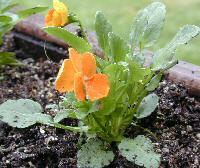 The spring rains fall into the sponge like foliage, and the moisture, in turn, rises into the heat of the afternoon. In spring time, the rain seems to fall... up. Suddenly, the sunshine came out again, and the light was fantastic for photography. I grabbed my camera, and set out. 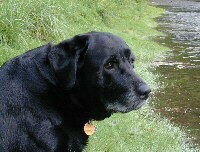 Bill told me yesterday that he finds it difficult to go down to the river, since we can't fish. I have found a whole new world in the river, during the fishing closures over the years. At first it was difficult for me, also. Now, I have learned to appreciate things that I wouldn't have noticed with a rod in hand. I can concentrate more on agates, or stare into the wonders of life in a small riverside pool. In them, live bugs and fry, and nymphs, like little natural aquariums! It is the dogs turn to enjoy the river. Kilchis races from shore to shore chasing dippers without reprimand, and Dee Dee gets to retrieve sticks! A walk to the river, seemed just right! Kilchis was digging for...who knows what! Dee Dee found a spot in the sun. ...later, I crawled back upstairs for a long, springtime nap. Bill and I have been removing wallpaper from the kitchen, and will begin painting, today. Warning: Removing wallpaper is not a fun job! I rarely think painting is fun, but after removing the wallpaper, I think painting will be a breeze! Delightful! Off I go. I'm going to try to write another chapter in my eye surgery drama! And... the storm hits today! My poor darling children! They were on the way up the hill when the most enormous thunderbolt shot through the sky! Scared little ol me! I'm sure it sent a slight shiver down their spine, too! Luckily, the bus left shortly after they left my sight, so I'm sure they aren't hurt. Just shook up a bit! Man, it was a close one! Just one boom, and then the storm passed. It is getting quite dark out, again, though. Will we have more? I have a love/hate thing with thunderstorms! I'll never forget snuggling in bed with the kids when they were little. They'd all come jump in my big bed when thunderstorms hit. I'd hear their little feet come padding down the hallway, half giggling, and half scared. I had a huge window over my bed, overlooking the bay. We'd peek our heads out, and then when it hit, cover our heads with the blankets, giggling! Those were the days! They don't do that, anymore! We finished the kitchen, and it is a lovely shade of dark moss green. The ceiling is stark white. I adore it! Now... I am on search for a coral pink colored salmon wall plaque. I can totally see it there. Who has it for sale? I need one!! Off I go. It's a day full of ifish, post offices, banks, and bill paying. How many days till the salmon get to Tillamook? I think this storm might give me a hint of things to come! Man! Were people ever testy on the board, last night! My plate was full, (and my dinner left untouched!) trying to manage it! I had to ban a member that had gotten on ifish for the fifth time, settle a squabble over here, and over there, and sheesh! Are the fish not biting, or what? I finally put my dinner down, and went to bed. With the recent rains, the river is absolutely lovely! It is pure tease and torture to not be able to toss a line out. It is the most perfect steelhead green, and I can only imagine the late winter natives that are hidden beneath the frothy water that splashes over the rocks, and heads out to sea. Deep pools swirl gently. Perfect for jigs! The area just behind that rock, perfect for a corky and shrimp! Dang! I can't stand this!!! Maybe that is what is going on with other folks, also. The rains would seem to bring in lots of fish! The thunder, also, is known to put them on the bite. Are they not biting? I think I'll drive out to Memaloose and Fifth street, today, to observe the conditions, and see if I see any sign of fish, or fisherman. Who knows? Maybe they are here! That would surely improve my mood! I have not wet a line for over two weeks. That's enough to drive anyone mad! The cats, Molly and Jack, are on my desk, locked together in a playful fight. Kilchis is napping at my feet. It's another rainy, April morning. Everything is fresh, and wet, and lush outside. Everything is shouting spring salmon, to me. I can taste the salty breeze in the air, from here. Yes, it's time. I can feel it! Spring chinook on Tillamook Bay! I can't wait! Oh! I did another chapter in my ocular drama. Click here if you want to read it. It's kind of fun, remembering all of this. I have stored it back in my memory, and it's difficult finding all of the files, in my brain! It's coming together, though! 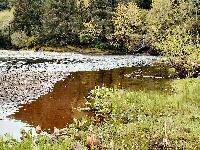 My walks along the Kilchis river, of late, have been bringing back vivid memories of fall chinook. Do you know what it is like, to stand thigh deep in the Kilchis river, and have a 50 pound salmon swim so close to you, that his tail lightly swipes your leg? But now, I stand in a trance, remembering, as the gentle spring waves lap at my cut off boots. I stare out at the vacant river. The Kilchis is at a very fishable level right now. But, it is closed. Everything looks perfect! 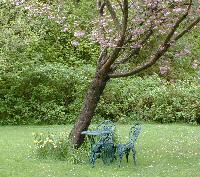 Except for the overhanging lush green branches, and the spring flowers that pop out unexpectedly. Except for the warm evening temperatures, everything seems like steelhead or salmon should be here. The opaque green of the river is vacant. I stare into it, and across to the other side, and dream dreams of what I have experienced, and what I have been blessed with. How I long for something to break the surface of the water, and surprise me! Even an otter! Please! Last Fall, I was fishing next to Bill, standing thigh deep in the Kilchis, when the water exploded with the surprise force of a salmon's leap. It was so close to me that I jumped, too! I struggled to maintain my balance, and straighten out the grin on my face, I said to Bill, "Did you see that?" (Of course he did! He couldn't miss it!) The fish jumped again, even closer! Then, a bit further away! And then, again! These moments happen so fleetingly, and then disappear. Did it happen? Yes! I didn't catch a salmon that day, but I remember that day more vividly than other fish catching experiences, and I realize how valuable that memory is, to me. Close fish encounters of the best kind. I do like to SEE fish, as much as catching them! People ask, "Did I catch a fish?" Well, yes! I caught a glimpse of one swimming over there! And a whole school of chum, swimming over there! A glance over the side of the boat, shows a single spawning hen, struggling to keep her balance in the current, as she finally loses the battle, and is swept downstream. My best memory of testing out my Water Ready Pontoon for the first time, was gently skimming down the Kilchis river, barely disturbing the glassy surface, and watching steelhead dart past me, in less than a foot of water! I must have caught 20 steelies that day! Or, glimpses of them! Several times in the past few weeks, the memory of that salmon jumping so close to me, has engaged me to the point of stopping my walks, and staring blankly at the water. The river is closed, and I can't fish. But it is in this time, that I collect my memories and learn to appreciate things that perhaps I would not take the time to recall, if I were busy, with rod in hand. I am blessed with rich memories of things that I adore, most in my life! I can see! I can see salmon! I can frankly say, as I look back to my experiences, that whether it be as I live them, or simply as I remember them, I am living a dream! Tillamook Bay Springer! 27 3/4 pounds! The picture above, thanks to Marie, at Tillamook Bait. This fish was caught on Bill's home made spinner, and Marie's new... well, I'll tell you. Her new, "Banana juice" scent! I'll tell you, I had little faith in the stuff, when I first saw it. Bananas in the boat? And Bill is using it? Horrors! It works! Twenty minutes into our shakedown run, yesterday, on Tillamook Bay, Bill's rod bent over. It wasn't that normal "tick" that you feel, when a fish hits a spinner. It was a soft touch. Bill lifted up his rod tip, just in case, thinking "oh, maybe a spent steelie" and "It IS a springer!" echoed across the bay! It was a real hoot, because we were fishing in less than five feet of water. Man, was this fish hot! 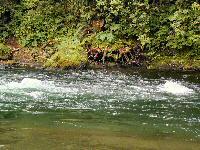 You know, the springer run in Tillamook is very light. (I have heard the run to be well under 1000, but I need to confirm that, today.) However, they are routinely bigger, and they are more apt to bite than our fall chinook, who are ready, or near ready to spawn, by the time they come in. I had bugged Bill to go try the bay, for a week, now. He kept saying, "Jennie, there are probably one or two fish in the bay, right now. These are not good odds." "Yes!" I told him, "But, Bill, we are the springer people, and no one will catch one, until we do!" And we did! Oh, Jennie of lots of faith! I'm glad we went! My schedule is stressing me out, and I'm not sure what to do! I'm suppose to fish this morning, come home, make a chocolate cake for BOE's jetty party, head to Portland to stay at STG Rule's home, and get up to fish with David Johnson at 0' dark thirty... then, drive home the two hour drive, and hit the jetty party tomorrow night. I am going to judge what I am going to do, and not what to do, by how I feel at noon, today, and how sick I decide I want to be, afterwards! That seems negative, but experience has shown! Off I go. We caught a springer! Did I tell you that? It's summer! Or, it feels like it! David and I were down at the overflow ponds on the Kilchis, last night, saving fry, again. Five at a swoop! They are thick in there! We also skipped rocks, and man, is he good! I sure wish we could just carve a river path from the overflow puddles to the river, but it is so far away! It would take us ages! It's been at least two weeks since I've been to a doctor. So, it's time, today, to take Andrew. He is taking driver's education, and if he misses another class, he'll flunk the class. It's tough getting him through things like this, with all of his medical appointments. Luckily, they have early morning classes, so he will go to the early morning class, and then, we are off to Portland. It's supposed to be brutally warm in Portland, today. I think I'll wear a sun dress for the first time, all year! I think Roy Markee deserves special mention, here. He is one of the neatest guys, and a great example of what makes me proud that I have ifish. His jetty party is always my favorite ifish event. The food! The beach! The fellowship! Plus, he makes a darn nice fishing rod, and helps all the other ifishers to learn how to make them, too! Click here, to see. Roy puts on rod making clinics, and I've heard wonderful things about them. They always fill up, fast, so if you are interested, let Roy know! He goes by "Bait of Eggs" on the ifish discussion board. Well, as much as I'd like to stay home and plant the garden, or cruise the sunny waters of Tillamook Bay for chinook, I'm off to Portland, once again. I think my truck has worn tracks to the doctors in Portland, and I don't even need to steer. Way too tired to write anything intelligable! I didn't sleep last night! I have so much to do, too! It's one of those days that I have to just take it as it comes, and look forward to nightfall to try and catch up on my sleep! After my trip to Portland, I went out and saved another 10 fry from the overflow pool. There are probably 20 left, and it's more challenging, now. Some of them are really tiny! I'll save them all! I will! Oh my gosh! Molly just brought in another chipmunk, and we have to go try to get it out of the house. That darned cat! That Elvin Bishop song, "Fishin'" is going through my mind, and that's just what I'm going to do! You know, "Just to ease my mind!" I'm going fish, fish, fish, fish, fish, fishin! Nobody has the lyrics online, and I can't remember them all... but if you want a great fishing song, this is it! Anyhow... I'm running late, and can't wait to wet a line... Off I go. When I get back, yes, I'll have tons of e mail to answer and tons to do to catch up! But, it's worth it! This girl has got to go! I'm going fish, fish... fish... fish... fish fish'n! OK, now I've got that song running through my head and it won't quit! I'm fighting, tooth and nail these days, against something that I do not want to recognize. The whole thing seems unfair. The whole thing seems so wrong, and so targeted, that I can't believe it is happening, and am I'm still in a sort of denial. When I go salmon fishing, I get so sore from holding the rod all day, that I can't move for days after! I'm sure it is marfan related, but come on! Holding a rod? I know that this happens to me after fly fishing. It took me months to finally admit it. I fly fish, I can't move! (Guess what? I still do it! Every night, in the summer!) I WILL find a way to do it that doesn't hurt! So now, in the summer, while I fly fish, I try different things to see how I can prevent the soreness and stiffness. It's like a challenge to figure it out. Just like playing the piano and getting sore, or sitting at a computer desk, and getting stiff, I think there must be something I'm doing wrong in my posture or technique that causes this. And, likewise, when I've attended physical therapy, they teach me ways I might hold myself, to prevent, or lessen the stress on the muscles I use. When I used to play piano, my coach used to stand behind me. When I'd get to difficult passages, my shoulders would creep up, with stress. She would be right there, to push them down again, to remind me to relax. You don't play well, when you are rigid. Likewise, I don't fish well, or feel good, after! I turned it into a sort of challenge. I make sure I am standing with good posture. I make sure I am breathing deeply. I try to relax, and cast effortlessly. There is a whole lot more to fishing, for me, than catching! I want to fish and feel good, afterwards! I know that fishing is very intense for me, so I can imagine why I get sore muscles. I get so into it, that I don't notice how much stress I am placing on my muscles, until afterwards. Sitting in a boat, spinner fishing, I am constantly holding my rod up, making sure my spinner has that constant throb that means I am trolling exactly at the right speed. If I rest my rod on my knee, then I can't feel that throb. I lower my rod, to make sure it is right off of bottom. I bounce the weight, to make sure, and up one wind! I hesitate, or actually refuse to put my rod in the holder! Spinner fishing on T bay requires that you feel! Since I am visually impaired, anyhow, this is doubly important. I have always felt and listened my way through life! So, rod extended, I can feel the strain on my shoulder muscles. While doing so, I try to maintain a perfect, erect and relaxed posture. I breath deeply, while I search for bottom, with my weight. Shoulders back, Jen! You don't want to hurt! Last week, I fished twice for salmon, for a total of about 8 hours. For three days afterwards, I could barely move. This has got to be a cruel joke! I refuse to give it up! Fishing is my love, my passion, and without it, I would surely die. I guess they say that inviting love into your life, is inviting pain. I always thought they were talking about relationships, not fishing! Behold the rose but beware the thorns! Well, I fished for four hours yesterday, and today, although a bit stiff, I think I'm not as bad as last week. I hope! I'm almost considering going to a physical therapist, or a sports medical doctor to tell them what I do, and ask advice on how to do it with the least amount of stress. They'd just better not tell me to put my rod in the holder! I'm doing upper body strength exercises, to try and build up my muscles, there. I'm using this rubber band therapy, that I learned from physical therapy in the years past. I'm also doing some yoga. Something has got to give! I had some fun, doing a search on love quotes, and replacing the "love" meanings, with the word "fishing!" Here they are. See if you can come up with some, yourself! -Better to have fished and hurt, then to never have fished at all. But I have seen fishing And thou art enough. -I love fishing - those three words have my life in them. until you have truly fished, and you will never understand what pain really is until you have lost it. Without rod in hand, live no life. Is the only sensible way to fish. But fishing to some extent protects us from age. The last day of the April Fundraiser! Thank you to all who have helped ifish. We appreciate it! It's hair day! I love hair day! I get to spend the morning with my favorite hair dresser, and be pampered! Well, I'm off to girls day. Have a great one! Oh! By the way, yesterday's column inspired a thread on the discussion board! I adore it! It is truly my favorite thread on ifish, ever! Click here to read!